A downflow containment booth constructed with a 100% HEPA filter ceiling is shown on the left. The HEPA ceiling construction method must have a large frame with gaskets to support the heavy filters. In addition, the filters have a frame around the media. The combination results in a wide space where there is no airflow. In addition, the addition of lights will further create space where there is no airflow. The result is shown above using a smoke generator. The OEL in the operator’s breathing zone is typically 100 ug/m3. 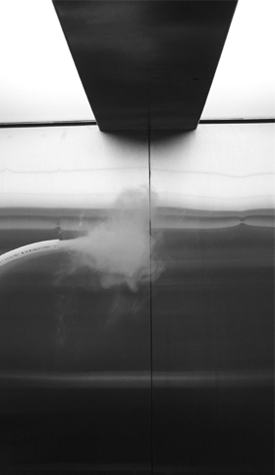 An operator standing below the frame junction between two HEPAs will breathe powder that is drawn upwards from dispensing or sampling. A downflow containment booth constructed with a membrane diffuser ceiling is shown on the right. The membrane diffuser ceiling construction ceiling has a narrow light weight frame to support the light weight membranes. This method results in a minimal dead air zone. Lights are located above the membranes, which results in no dead air zone below. 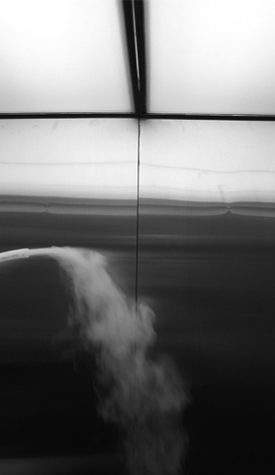 The result is shown above using a smoke generator. The OEL in the operator’s breathing zone is <20 ug/m3. An operator standing below the narrow frame junction between two membranes will not breathe powder from dispensing or sampling.